Brag Monday – Lovely Tags, Beautiful Box & A GIVEAWAY! This GIVEWAY is now CLOSED, a winner will be announced soon, thank you to all of you for participating! Well, it’s time for the 17th Brag Monday! I’m going to discuss the giveaway first and then the bragging will commence! My enameled metal number tags, that you see above, were featured in the Winter issue of Boho Magazine!!! Woohoo! This was my first mention in a magazine and I am super excited!!! In order to celebrate, I thought I would give a set away here. If you would like to enter, leave a comment on this post. The giveaway ends on Friday, and you may enter once per day. And as a bonus, for anyone that is participating in todays Brag Monday, you will get 2 extra entrys for linking up! Please note: This giveaway was provided by me, via my Etsy shop. So now let the bragging begin!!! Today I’m bragging about two people. First up is Beth Leintz from Gathering Dust. Beth created these two absolutely charming tags!! Aren’t they exquisite!! 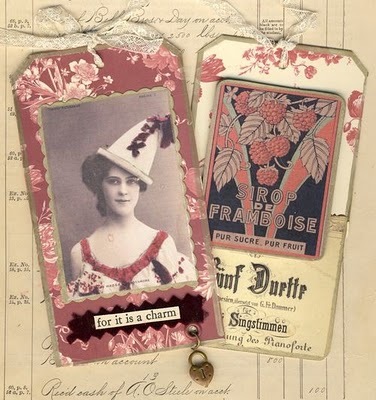 Beth used the lady Pierrot image that can be found HERE, and the French Raspberry Label image found HERE. Make sure you pop over to see Beth’s blog, she has such an eye for all things vintage and antique, and she puts things together in the most remarkable way!! Next I’m bragging about Corinne Clark from 100 Pretty Things. 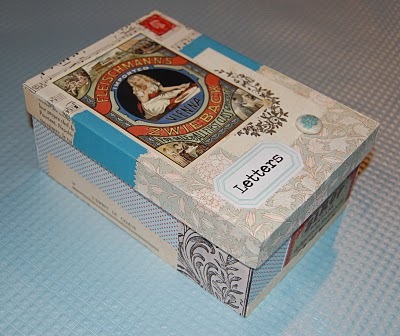 Corinne made this gorgeous box using several images from this site and mixing them up with some beautiful papers. You can find the image of the little girl HERE. 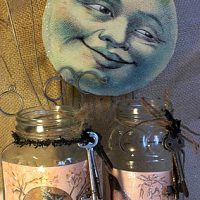 She has a fairly new blog, but is quite an accomplished mixed media artist and has been featured in many magazines and books. Be sure and stop by her blog, I’m sure you will adore her romantic style! beautiful projects using your images…i love the mix of pattern and papers that both of the girls used…thanks for sharing Karen!!! Love the numbers, Karen, and I’d love to be entered! I’ll have to visit these two ladies and check out their blogs, they are new to me and I missed seeing these items last week. Thanks so much for providing such wonderful graphics. Thanks to you I have discovered a love of graphics and papers, and turning them into something pretty! Congrats on the magazine! You deserve it! Please enter me in the giveaway! I would absolutely love the numbers! Would love to win! I just did something with numbers too on those little tags. I love these too! Hi Karen! Love your blog! Congrats on the mention in the magazine, that’s seriously cool. I am loving those tags….oh the possibilities!! gorgeous. love the projects! and the numbers are super cute! The tags are so neat…count me in on the giveaway! Thanks! Cool tags! Congrats on the magazine mention! TAGS! Awesome, I love tags! Cute projects this Monday Karen!! 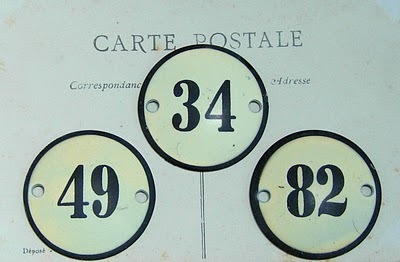 Love the enamel numbers they are great. Congrats for being in the magazine. 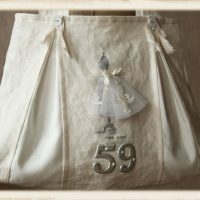 Beautiful numbers–count me in to enter the giveaway! I did make the burlap napkin holders at Thanksgiving that was on your site–unfortunately, I don’t have photos because everyone wanted to take theirs home. Congrats on your mention in the magazine. Great number tags, thanks for the chance to win. Thanks for providing such wonderful graphics! I love the tags, they are just so “vintage”. 🙂 The two artists featured in your bragging post are definitely providing the rest of us with some fabulous inspiration. Thanks for sharing. Congrats on your feature Karen and lets hope for many more! I seriously need to take one of your classes! When I look at everything you do I am just stunned!! You are an amazing talent! my first comment on a blog! cool tags, and great site! 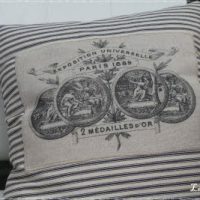 The tags look french vintage-Love it! I already have a couple of ideas for the numbers. Please count me in! Those number tags look awesome and those projects are FABULOUS!!! Good job ladies. Lovely giveaway, and great choices for brag Monday – I really covet that letter box! Congrats on the mention in Boho and love those #’s! Who wouldn’t love to win this giveaway, those numbers are gorgeous! I have thoroughly enjoyed seeing your gorgeous old graphics for some time now. So much so that I have started messing around with papers and mixed media bits ( all of two projects lol ). But it has also encouraged me to encourage others to have a go, with my first mixed media giveaway. Thanks for getting me started! There’s just something about number tags, isn’t there. Perhaps seeing those numbered tags makes the imagination run wild as to what’s behind the number. Thank you for providing us with such great images. I used some to adorn a few Christmas presents. Congratulations on being in the magazine Karen. LOVE Brag Monday! So many beautiful and inspiring projects out there in blog land!! I discovered your blog shortly before Christmas and must say that I thoroughly enjoyed the Santa graphics. I used them for several projects and looking forward to making even more! The number tags are fantastic and would love to win them! oh my I would love to check out that magazine! thanks for Brag Monday – it’s so much fun to participate. Oh, and I do love the numbers. Awesome Tags! And congrats on your magazine debut! love the enameled tags…count me in!! i just stumbled on your blog whilst google image searching “vintage circus elephant” as reference for a painting i’m about to start working on. it is great! what a treasure, you can see my work at heathergabel.com, i do a lot of collage as well and i’m sure your site will be an invaluable resource to me in the future! i ove the 2 brags you chose this week as well. lovely stuff. keep up the great work! Well first of all, congrats! How exciting for you! Bragging and gifting, what a wonderful combination on ANY day, but particularly on a Monday! I’d love to be entered in your contest! You’ve also made me think about sharing some of my brag-worthy things, now for the time to do so! Beautiful tags and love the box. Talented artists, for sure! Please enter me in your giveaway. Oh, I just love your site! Thanks for all the wonderful ideas and images. Thanks for the give away chance too! I just read that 2010 is th Year of the Digit so your number tags are perfect. I love anything with numbers on it. Your set is beautiful and I would love to have them to use in my house. Thanks for the giveaway. Love your number tags and also the sites you pointed us to. Thanks for the opportunity. longtime lurker…first time commenter. 🙂 Congrats on your #’s being featured! And ooh…love those other projects by those talented ladies! I love the tags that were made from your vintage artclips. Congratulations on your name printed in a magazine. I am happy for you and you deserve it. 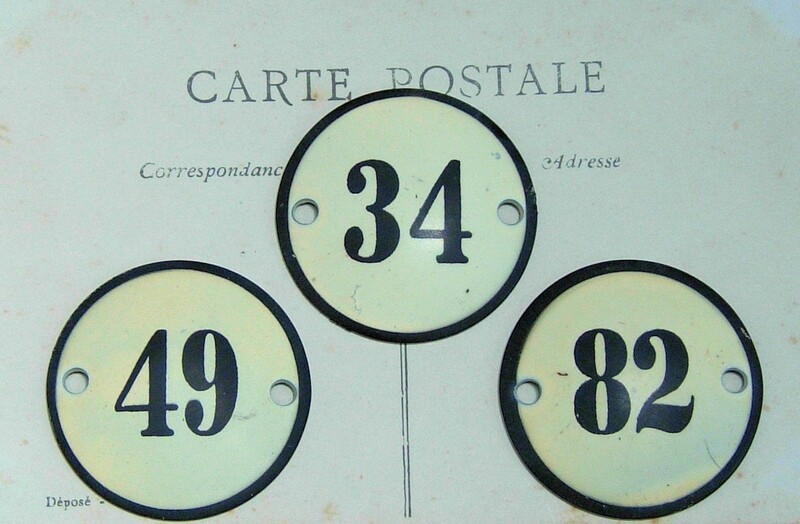 Have a great day and thanks for a chance to win these really lovely number tags. I would love to use them in mini journals. Great projects for Brag Monday!!! Thank you for sharing all the wonderful images with us! You have such great artwork on your brag pages. It’s always a pleasure to see what folks are doing with your images. Simply love the tags shown here today, in my favorite colors too – so inspirational!! Congratulations on your magazine write up. How exciting. One of these days I’ll post something with your lovely images! I’d love to be entered in your # giveaway too! I am a great fan of your blog, thank you for providing all these great images! Hmmm…just found your brag Monday…and I love it! Looking forward to participating soon! Please put my number in to win the great tags! And now I;ve got a number of blogs to get to! Thanks again for sharing all this creativity! I love your wonderful blog. It is so inspiring and you post the most creative projects and images. Please count me in for your draw. I would be thrilled to win! I would sure like to be entered into your giveaway! Thanks! Wow. I adore these tags! As with so many others, I’m so into numbers right now!!! I love following your blog, because you always have the greatest images to share! Isn’t this just the best! A chance to share all the beautiful things everyone makes – thanks to Karen who provides the inspiraion!! I’d love to receive those numbers…and I love browsing the brag monday items! Yes I do! You do a wonderful job. I love the tags – I hope I win!!! ohhh congrats on your magazine feature!!! Thank you for an inspiring blog! I would love to be entered into your giveaway! The numbers are so great! I just love seeing what everyone does with your images. And congrats! I love the little tags you have here. I have not been reading your blog very long, but really am impressed with the variety of images you share. Beth over at Gathering Dust gets the thanks for sending me your way. Thanks! Oh the numbers are great. Congrats on the mention. Thanks for the chance. Congrats on the BOHO Mag Mention! That is so exciting! I am super happy for you! Congrats on your BoHo debut! Please enter me in your contest. Congrats on the magazine mention!! OMG, do you make those metal number tags. You are brilliant. I love them. Please enter me in your Giveaway and stop by and see mine. Congratulations on the feature – so exciting for you – Yay!! Just another entry in the sweet giveaway! I like the idea to cover the old box. I save shoe boxes and use them for craft things. Now I can make them pretty with this great idea. I sometimes would use wrapping paper but I love this idea even better. Thanks for sharing. Hugs to you and have a great day! I saw your tags in the magazine, congratulations. The entire article was beautifully done. Boho is a very cool magazine. Please enter me in your giveway drawing. I just discovered your blog not too long ago and love it. Beautiful tags using your images. Love your numbered tags. Thanks for another chance to win. I love everything about your blog! Thanks for the Brag Mondays – they are so inspiring – and I’d love to be entered for the tags too!